With proteins, small motions often have large effects. A new structure of the A2A adenosine receptor reveals these motions for an important class of proteins: the G protein-coupled receptors. GPCRs transmit messages across cell membranes, capturing signaling molecules like adrenaline and dopamine, shifting shape, and launching a cascade of messages inside the cell. The atomic details of this signaling has been largely a mystery, since previous structures show the receptor in an inactive state. The new structure fills out the story, and captures the receptor in the activated state, after it has bound to its signaling ligand. Adenosine receptors are found on cells throughout the body, where they play many different roles. There are four different kinds, each with a different spectrum of responses when activated, controlling diverse processes such as pain, blood flow, respiration, and sleep. Often, the different receptors can have opposite effects. For instance, some forms enhance inflammation when they bind to adenosine, but the A2A adenosine receptor reduces inflammation. This makes them quite challenging as targets for drug action, since it is important to block only the desired receptor, and not the others. The A2A adenosine receptor plays an important role in controlling inflammatory responses, and thus is a target for development of anti-inflammatory drugs. For instance, a drug that binds to this receptor and activates it could be useful for the treatment of asthma and COPD (chronic obstructive pulmonary disease), two diseases where the lungs become inflamed, limiting the amount of air reaching the body. This type of drug is termed an "agonist", as opposed to "antagonists" that block the action of the target protein. Researchers have been searching for both types of drugs: agonists to activate the A2A receptor, and antagonists to block other receptors that increase inflammation. The new structure, solved by Ray Stevens and coworkers at PSI, captures the A2A adenosine receptor bound to an effective agonist drug (PDB entry 3qak). 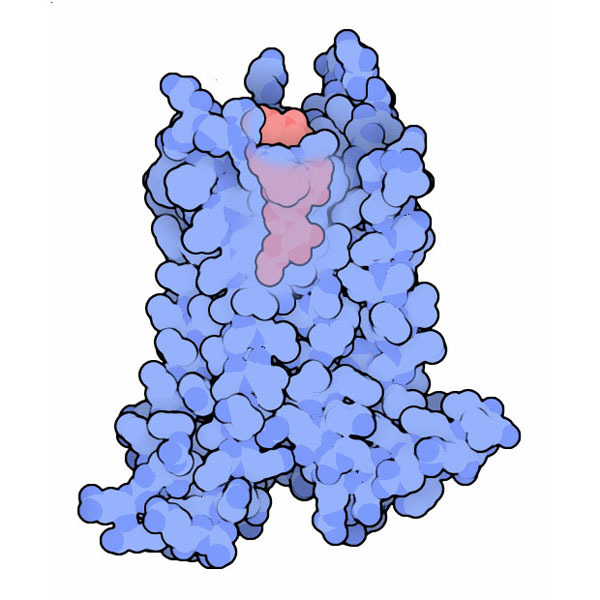 The receptor adopts a slightly different shape than that seen in a previous structure with an antagonist drug (PDB entry 3eml). 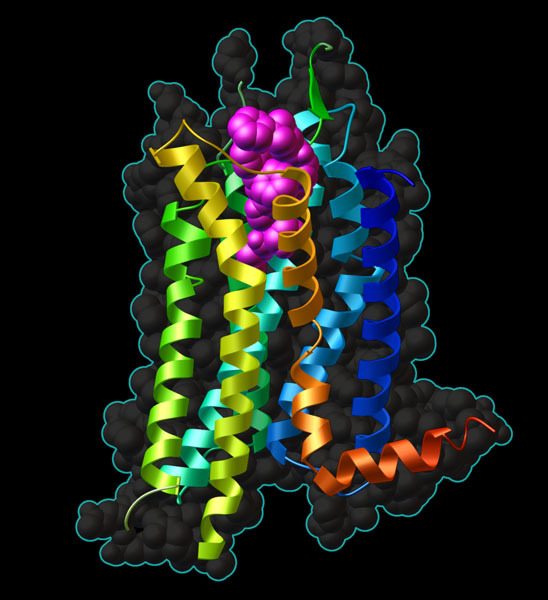 The receptor is composed of seven helices stacked side-by-side, and these helices slide relative to one another when the drug binds. The ribose portion of the drug seems to be the key player in this motion. Both the agonist and antagonist have a similar adenine ring, but only the agonist has a typical nucleoside sugar. It interacts with the helices surrounding the binding site, shifting them by several Angstroms. This motion is propagated inside, where it is presumably sensed by G-proteins, leading to the signaling cascade. Binding of adenosine shifts the structure of the receptor to the active form. Use the buttons to flip between the active agonist-bound form and the inactive antagonist-bound form and see the motion of the receptor. There is also a button to show just the adenosine portion of the agonist ligand. In each structure, the adenine portion of the molecule is colored green, and the ribose portion is colored magenta. Xu, F. et al. Structure of an agonist-bound human A2A adenosine receptor. Science Express doi:10.1126/science.1202793. Jaakola, V.-P. et al. The 2.6 Angstrom crystal structure of a human A2A adenosine receptor bound to an antagonist. Science 322, 1211-1217 (2008). Polosa, R. and Blackburn, M. R. Adenosine receptors at targets for therapeutic intervention in asthma and chronic obstructive pulmonary disease. Trends Pharm. Sci. 30, 528-535 (2009). Jacobson, K. A. and Gao, Z.-G. Adenosine receptors as therapeutic targets. Nature Rev. Drug. Discov. 5, 247-264 (2006).